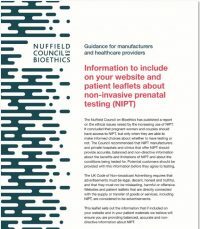 The Council produced a leaflet for private providers of non-invasive prenatal testing (NIPT) to provide guidance on the information they should include on their websites and patient leaflets about NIPT. The leaflet covers the essential information to include, such as information on test performance, the possibility of a failed test, follow-up diagnostic testing, and the genetic conditions being tested for, such as Down’s syndrome. The information should be provided in an accessible, jargon-free way and providers should be careful not to use offensive language.